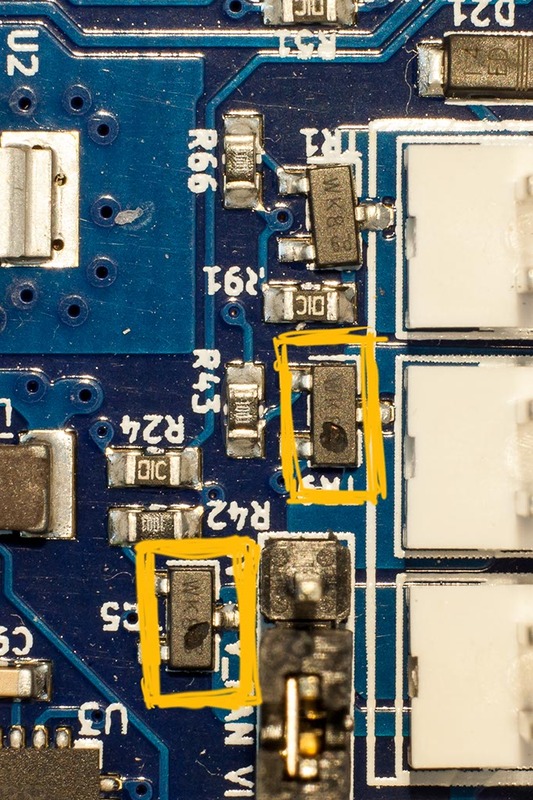 It seems to be a pretty common thing to do, damaging the fan MOSFETs. I had connected Fan 0 to a mini 12V step-down module (the Duet Wifi is running on 24V) but I'm an idiot and had it reversed (i.e. Fan 0 going into the "out" of the converter and the fan connected to the "in"). The fan worked for a bit but when I changed the speed there was a spark. Of course I had to make things worse by connecting it the right way round to Fan 1 and killing that too. Perhaps I'm lucky that I still have one working PWM fan output and there doesn't seem to be any other damage to the board. The dilemma I have is that I don't possess a hot air gun and I don't think I need one except for this task. I could possibly buy a Duex2 for about the same cost; I could have a go with just a soldering iron; alternatively I could live with just one controlled fan if I had the extruder fan on 100% all the time. Maybe you can find someone who has hot air equipment and can replace the MOSFETs for you. Is there a makerspace or hackspace near you? Which country are you in? Yes, I apparently fried mine as well. I do get some voltage through, but only 7.75 on those that function and 0 on the others. I'm in the UK but unfortunately don't know anyone into electronics. There is a FabLab here but they weren't keen on allowing the public in when I contacted them a while ago. If you PM me later this week I may be able to help. What Mosfet is a proper replacement? I can read the WK8 but not what is after it. is it uncommon for this to happen, I have around 200 hr on the board, thats it. The fan mosfet will blow if you short the corresponding output. Depending on the fan, it might also blow if you connect the fan wires the wrong way round. Found this with some help from Google, but no idea if its right, Google can be like WebMD you go in with a paper cut …next thing you know you're going to die. I also blew a couple of the fan mosfets, my fault , and was able to replace them without using a hot air station. I used a small pointy soldering tip and liquid flux and some small copper braid and no coffee before doing it. If you don't have much soldering experience I would suggest watching a few youtube videos on SMT removal without a hot air station and practicing on some junk electronics first. I sent a message (I think), hope you got it.